How Is This Even Possible? Is He The Best Bike Stunter Ever!? - Muscle Cars Zone! How Is This Even Possible? Is He The Best Bike Stunter Ever!? Besides the engine power and torque, we pay a great deal of attention to human talent as well, meaning that we share powerful vehicles but also the gifted drivers and bikers have their own rightful place on this website. And the biker you are about to watch has justified his rightful place here on Muscle Cars Zone thousands of times! It is a word of the Polish motorbike master Rafal Pasierbek, also known as Stunter 13! This performance of his always leaves us speechless, no matter how many times we`ve seen it already, making it almost impossible to find the right words in order to praise this spectacular gearhead! 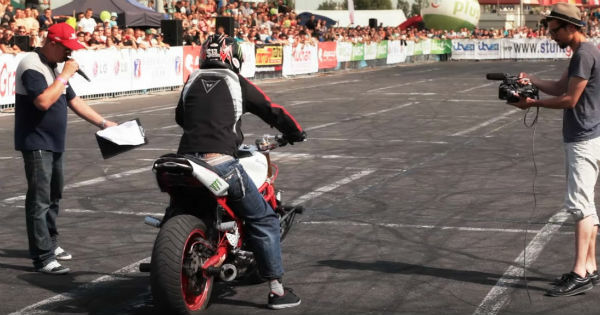 No wonder he won the 1st place at this edition of Stunt Grand Prix! However, it is always good to remind that it is important to possess the talent, but it`s more important to practice. We believe that Stunter 13 has spent countless hours in order to perform the tricks you are going to watch. That just does not happen overnight. Also, the large number of views and shares speak for themselves. Rafal Pasierbek makes the front wheel and rear wheel wheelie, while sitting on the gas tank, look like a child`s play. Plus, doing burnouts like nobody before, jumping on the bike whilst performing a wheelie are just a fraction of the tricks you are about to watch. Enjoy! At last, click here to watch the fearless Sarah Lezito, one of the best bike stunter riders you have ever seen!